All over the World illegal fishing vessels are seized by Government authorities. In places like Australia, some of these have been sold or returned to the owners. 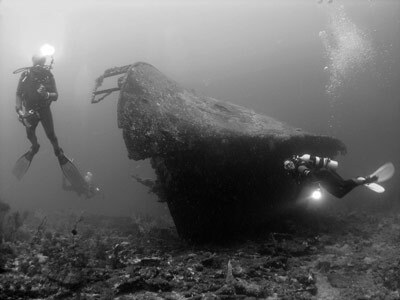 In other places, the seized vessels have been scuttled to create artificial reefs and dive sites. Such is the case with this dive site. The Der Yang was a fishing vessel, variously reported to me as being Vietnamese, Taiwanese or Indonesian. Whatever its origin, it appears it was found illegally fishing in Papua New Guinea waters (presumably in or near the Kavieng area of New Island) and seized by the Government. 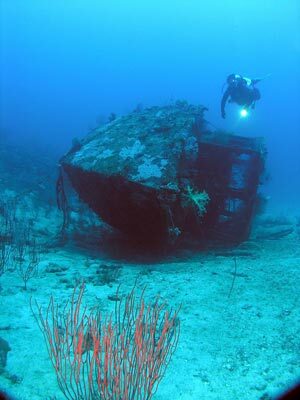 Eventually, it was scuttled as a dive site. This boat is located about 10 minutes run from the Nusa Retreat. I did not record the GPS coordinates, but it is north-west of the northern tip of Nusa Island, say about seven kilometres from the Nusa Retreat. There is a mooring here. The mooring is located on the stern which is in 30 metres. The wreck is lying on its starboard side facing down a slope. In fact, when this boat was scuttled, it was in considerably shallower water as you will later see. 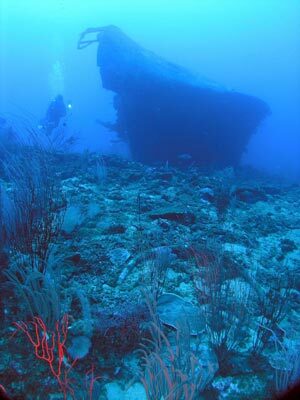 For now, swim down the length of the wreck to the bow. Just in front of the wreck there is a drop off to a flatter bottom. The visibility here is normally excellent so you should be able to see another smaller wreck right in front of you. 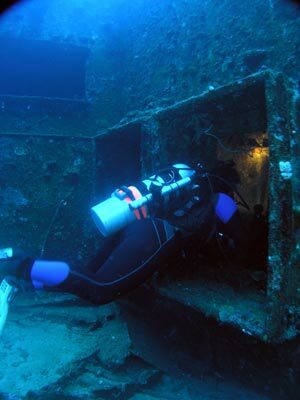 If you like, drop down to this wreck and you will be at about 42 to 43 metres. This other wreck is an unknown small vessel. It is only about 10 metres long and is lying on its port side facing the south-east (parallel to the reef). 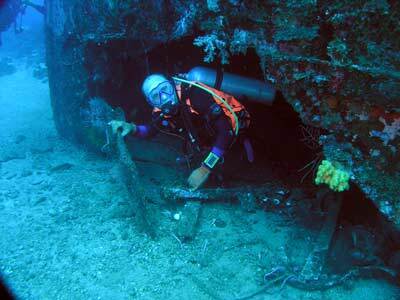 Spend a few minutes here examining this wreck before heading back to the Der Yang. Once back at the Der Yang, if you are a photographer, rise up a bit off the bow and you can get a very nice photograph. Otherwise, head along the deck of the boat towards the stern. There are a number of small holds between the bow and the bridge. If you look inside, you can see the refrigeration coils that line the hold. The Der Yang is about 28 metres long I would guess (based on my panoramic shot and the number of divers that would fit from stern to bow). The bridge is quite poky so not really worth trying to enter. Behind the bridge there are more holds. The engine room is also towards the stern. There is also a hole that provides access into the stern and you can see the prop shaft and steering gear inside. Once at the stern, head to the hull bottom and you can see the propeller. This has some nice anemones and clownfish around it and you can get some good photos of the bottom of the hull in the background. 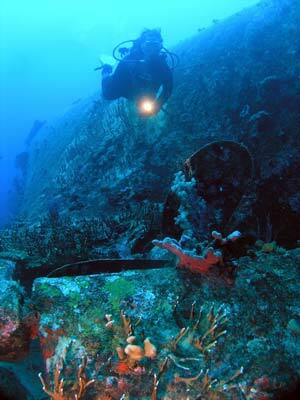 This dive ends, not by ascending back to the boat, but by heading back up the reef to the shallowest section. As you head away from the Der Yang, you can see a giant scrape in the reef. This is sand and has a shallow V shape to it. This is where the Der Yang slide down the reef some years back during a cyclone. Follow this and it will lead you back to the top of the reef which is about 15 metres. The reef is quite nice, with some very nice anemones, clownfish, gorgonias, sea whips and lots of smaller tropical fish. There were also lots of red bass around. As the reef top does not go all the way to five metres, you will not be able to stay for as long as you like on the reef. I ended up having to ascend to five metres for a safety stop after about a dive length of 42 minutes, giving a total dive of 50 minutes. The boat will collect you wherever you ascend. As mentioned, the visibility here is excellent, I had about 35 metres. The water temperature was 29°C. Well worth doing once on a trip.